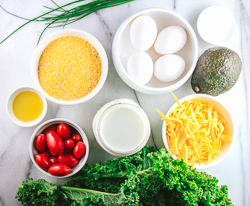 If you prefer savory breakfasts, this is the power bowl for you! 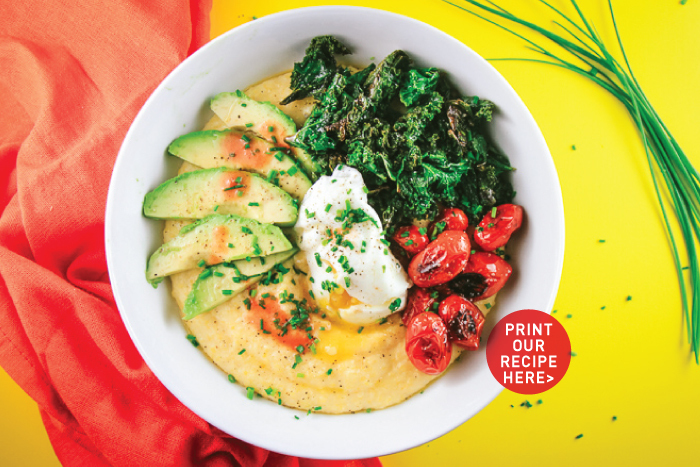 With a base of cheesy grits, this bowl gains additional health benefits from the blistered kale, grape tomatoes, protein-rich egg, and potassium-filled avocado. Finish it off with a dash of hot sauce and a sprinkle of chives for a very satisfying start to the day. 1. Boil the water, milk and salt in a medium saucepan over medium heat. Pour in the grits while constantly whisking. Reduce the heat to medium-low and continue to whisk until the grits are incorporated, roughly 5 minutes. 2. 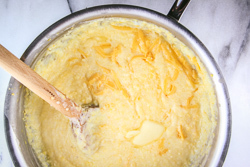 Use a wooden spoon and stir until the grits are thick and creamy, about 15-20 minutes. Add the butter and cheese and stir until melted. 3. 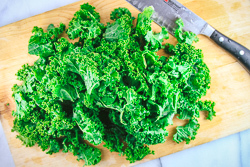 Meanwhile, heat the olive oil in a large skillet over medium heat and sauté the kale and tomatoes until the tomatoes are blistered and the kale is wilted and slightly charred. 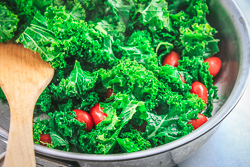 Remove the greens and tomatoes from the skillet. 4. Poach the eggs. In a medium sauce pan, bring 2 inches of water to a low rolling boil. Add 1 teaspoon of white vinegar to the water. (The vinegar will help keep the egg white together.) Break each egg into a small ramekin, and lower each egg slowly into the water. Simmer for 5 minutes, then remove from the water with a slotted spoon. 5. Build the bowl. Add scoop of cheesy grits, then top with the blistered greens and tomatoes, poached egg, avocado slices, chives, salt, pepper, and a dash of hot sauce.